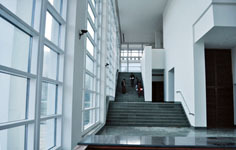 "The Royal Textile Academy, after the completion of its construction will comprise of a state of the art museum to showcase national as well as regional and global textiles and artefacts; a weaving school where students will be trained in the art of weaving, yarn dyeing and contemporary skills related to fashion design and merchandising and a well equipped and well managed conservation centre." - Her Majesty Gyalyum Sangay Choden Wangchuck, Chairperson of the RTA. 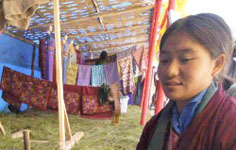 Imagine, in the center of Thimphu, in the shadow of Bhutan’s majestic mountains, a new cultural center alive with activities; a contemporary Bhutanese textile fashion show has tourists and international buyers buzzing; a sacred cycle of Buddhist ceremonies and performances enriches the spiritual lives of residents and visitors alike. Imagine the precious textiles of Bhutan coming home from private collections around the world to grace state-of-the-art exhibitions in an all-new textile museum. Imagine skilled conservators saving delicate historic sacred and secular fabrics from destruction while training colleagues from throughout the South Asian region to preserve their own fragile fabric legacies. Imagine rural women throughout Bhutan learning weaving skills that will produce critical income to improve the quality of their own lives while gracing a world market with their unique textile art. Imagine flexible auditoriums, offices, parking, shops and restaurants generating critical earned income to underwrite all these cultural activities, festivals, and celebrations. 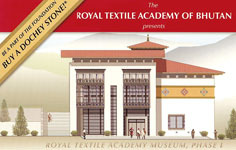 This is the vision for the Royal Textile Academy, a multi-functional center showcasing the cultural heritage of Bhutan and its most important living art form, textiles.